A priority in the Department of the Interior (DOI) is to increase access and recreational opportunities on public lands by connecting trail systems. 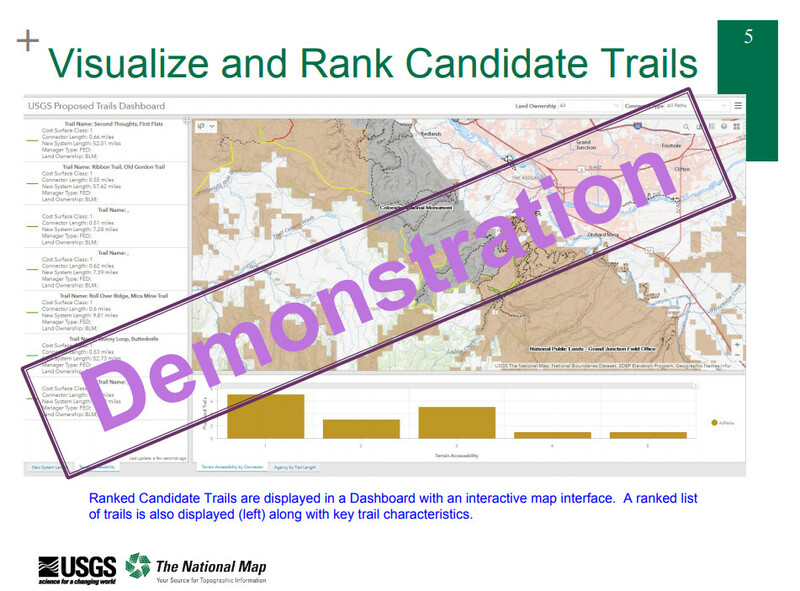 The USGS National Geospatial Program (NGP) integrates trails data nationally for the U.S. Topo map series and has support from DOI for a two year project to: 1) develop an interactive geospatial tool that identifies and prioritizes candidate trails; 2) improve the consistency and completeness of the national trails data set (Federal and State levels); and 3) create a mobile friendly application for agency and the public to update trails information. The NGP is using PAD-US as the source of protected areas data in these applications. PAD-US will provide the context that helps trail users understand their environment and make better choices about their routes. By its participation in the PAD-US supported Federal Lands Work Group, NGP staff learned about using PAD-US and saw how widely supported it is by federal land management agencies. Impact of NGP’s use of PAD-US: Saves time and leverages resources by using PAD-US to portray public lands, rather than aggregating data from various agencies.